Thousands of people have signed an online petition calling for World War I nurse Edith Cavell to be commemorated on a new £2 coin. Cavell helped more than 200 allied soldiers escape from occupied Belgium but was shot by a German firing squad. The petition was started after it was announced that former war secretary Lord Kitchener would feature on a coin. A Royal Mint spokeswoman said future designs would include other figures connected with the war. But she said she could not confirm or deny whether Cavell would be among them. Sioned-Mair Richards, 55, who started the petition, said she was surprised and delighted at the support for it. "It's really struck a chord with people," she said. Ms Richards, a Labour member of Sheffield City Council and a former mayor of Carmarthen, said she had admired Cavell since she was a girl. "Lord Kitchener represents all that I have always loathed about the First World War - the jingoism, the sheer waste of men, the 'lions led by donkeys' mentality," she said. "And then I thought of Edith Cavell, a heroine of my early childhood. 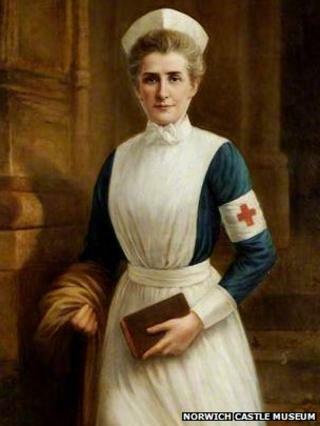 The nurse who was executed for giving succour to all wounded soldiers regardless of nationality. "The woman who is celebrated for saving the lives of soldiers in Brussels from all sides without distinction." Cavell, a vicar's daughter, was born at Swardeston, near Norwich, in 1865. Thousands of people lined the city's streets for her funeral procession before she was buried at Norwich Cathedral. The Royal Mint said the Kitchener coin, announced last week, would not be the only one to commemorate the centenary of World War I. "Over the course of the next four years, we will announce further circulating and non-circulating coins which will mark the centenary of the journey from outbreak to armistice," a spokeswoman said. "These coins will tell the stories of the armed forces, individuals, key battles and cultural and technological developments of that period, before finishing with a poignant reflection on the armistice and the ongoing legacy of the war." She said each would go through a "rigorous" planning and design selection process governed by an independent panel.